WhatsApp is the most popular messaging app in the world. The application has now achieved the milestone as it hits 1 billion daily active users on its service. Also, the Snapchat Stories clone, which is the WhatsApp Status, has managed to get 250 million+ daily active users. It is way more than Snapchat itself. 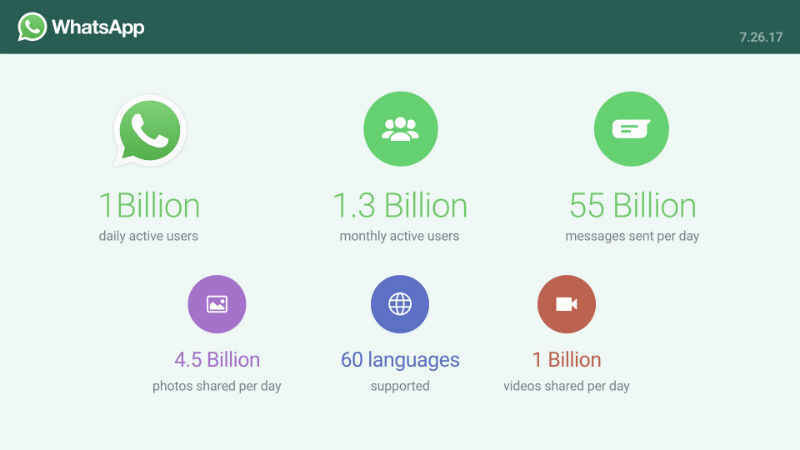 Up to last year, WhatsApp had 1 billion active users per month and now it has 1 billion active users per day. This is a huge increase in just a year, if we compare it with other social chat apps. However, interesting statics is about the messages sent daily, which is an enormous 55 billion. In the 55 Billion, there are 4.5 billion photos and 1 billion videos shared daily. To recall, Facebook has acquired WhatsApp for $19 billion in 2014 at that time it was having 450 million monthly users.